As the holiday season is upon us again this year, I am reminded of the 1914 Christmas truce (German: Weihnachtsfrieden; French: Trêve de Noël), when impromptu peace broke out among some of the opposing troops along the front lines. Several accounts vary as to whether or not British and German troops actually played any football (soccer) games during this unofficial truce. The following sources indicate football matches took place (my emphasis added to citations below). Some Germans stuck candles in small pine trees and used that as a white flag while they crossed over. Gifts of food, cigarettes and clothes were exchanged. Football games were played, and the Germans who played against the Scotts couldn’t stop laughing when they found out the latter wore nothing under their kilts. At first, the Allied soldiers feared it was a trick, but seeing the Germans unarmed they climbed out of their trenches and shook hands with the enemy soldiers. The men exchanged presents of cigarettes and plum puddings and sang carols and songs. There was even a documented case of soldiers from opposing sides playing a good-natured game of soccer. Several [accounts] mention impromptu kick-abouts with makeshift soccer balls, although, contrary to popular legend, it seems unlikely that there were any organized matches. BBC - What really happened in the Christmas truce of 1914? 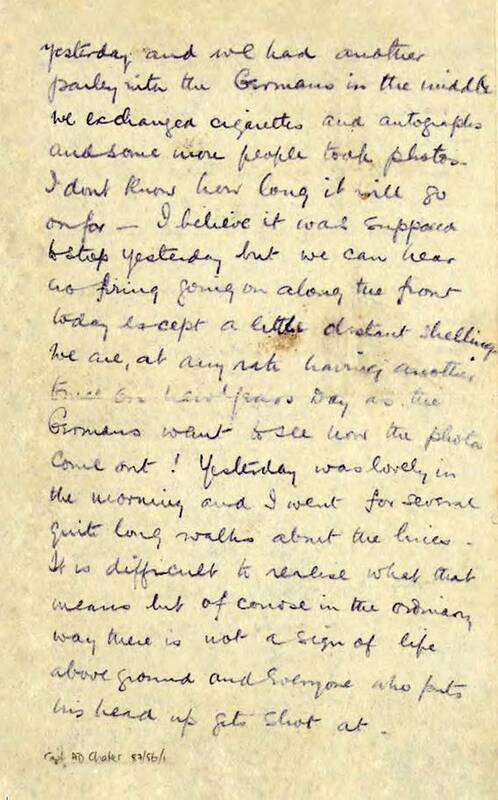 Spontaneously, they exchanged gifts and took photos - but it was importantly an opportunity to leave the damp of the trenches and tend to the dead and wounded of No Man’s Land. There wasn't a single organised football match between German and British sides. There may have been small-scale kick-abouts – but these were just one of many different activities men took the time to enjoy. However, the truth of the accounts has been disputed by some historians; in 1984, Malcolm Brown and Shirley Seaton concluded that there were probably attempts to play organised matches which failed due to the state of the ground, but that the contemporary reports were either hearsay or refer to "kick-about" matches with "made-up footballs" such as a bully-beef tin. Chris Baker, former chairman of The Western Front Association and author of The Truce: The Day the War Stopped is also sceptical, but says that although there is little hard evidence, the most likely place that an organised match could have taken place was near the village of Messines: "There are two references to a game being played on the British side, but nothing from the Germans. If somebody one day found a letter from a German soldier who was in that area, then we would have something credible." In fact, there is a German reference. 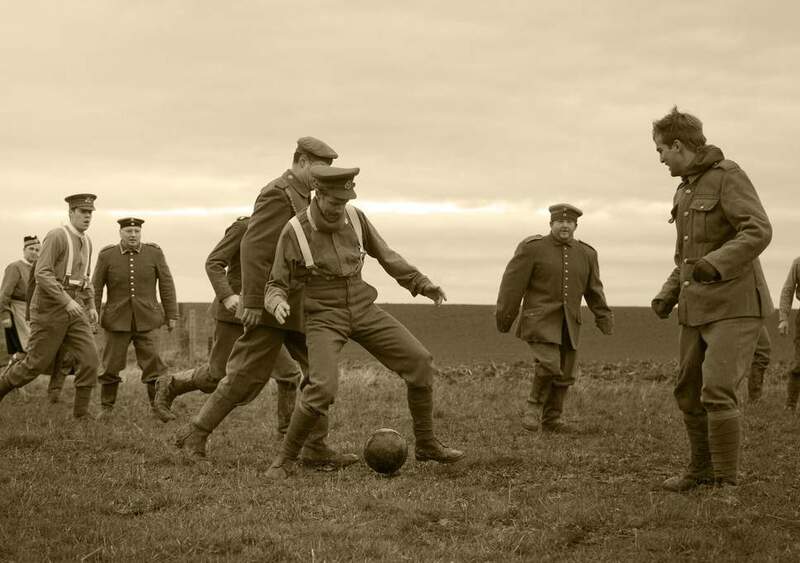 Lieutenant Kurt Zehmisch of Germany's 134th Saxons Infantry Regiment said that the English "brought a soccer ball from their trenches, and pretty soon a lively game ensued. How marvelously wonderful, yet how strange it was". In 2011, Mike Dash concluded that "there is plenty of evidence that football was played that Christmas Day—mostly by men of the same nationality, but in at least three or four places between troops from the opposing armies". I think Wikipedia is merely trying to honestly present the cases both for and against the claims of football matches, which highlights the disputed state of those accounts. But the manner in which the information is presented on Wiki is confusing as to their stance on this, and could be improved with some clarification. Is there any further evidence for or against these claims that could settle the matter? This depends a bit on the definition of "match": modern rules 90 minutes kicking, level playfield, three referees, 11 players on each side, two nicely timbered goals, etc. Most popular accounts now seem to imply this. If it's that, then it's a resounding no. But bringing a ball to the trenches (in itself quite an astonishing thing to do?) and playing with it going about between British and German soldiers? That occured. Multiple times. Although not nearly as often in reality as later reported. And much less organised as "match" implies. Even one 'real match' (or very few) might have occurred, against all unlikeliness. But most likely more like older forms of football. The important thing to distinguish here is that they did play, with 'a football', of whatever material, sometimes. And that they were really eager to do so on a very broad level. For the participants during the events and even more so later, in the aftermath of the war. Soldiers wanted to play. And people wanted to believe that they did. As time progressed, that desire apparently grew ever stronger despite the evidence for that not being able to match the pace. What did not occur – despite being now almost the norm in cultural memory – is the practice of widespread organised football matches. Despite being really one 'nice thing' about the war, and in itself a single occurrence would be quite remarkable, the representation in memory is not 'untrue' but somewhat inflated. So, yes, "the football matches during the Christmas Truce" are one of the myths surrounding the trenches. But at the same time that 'myth' is certainly based on quite a solid foundation, compared to others. 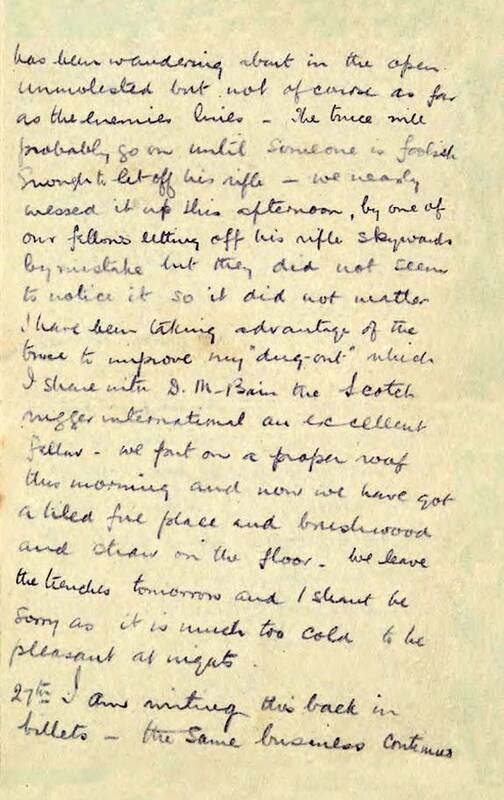 His letter to his “dearest mother”, describing the famous moment former enemies risked their lives to walk out into no-man’s land to wish each other a happy Christmas and play football, has been released by Royal Mail with his family’s permission. Comment to that picture, also used on the cover of a book cited later here: it may be from 1914. But I fail to see German soldiers in the picture, the field doesn't look like no-man's land and the people are quite scantily clad for the expected temperatures… This picture is copied thousands of times across the net, only rarely source attributed. Sometimes the source is given as 'Imperial War Museum'. Nice. Only that I can not find it there. If anyone can contribute to identification or other details, please do so. 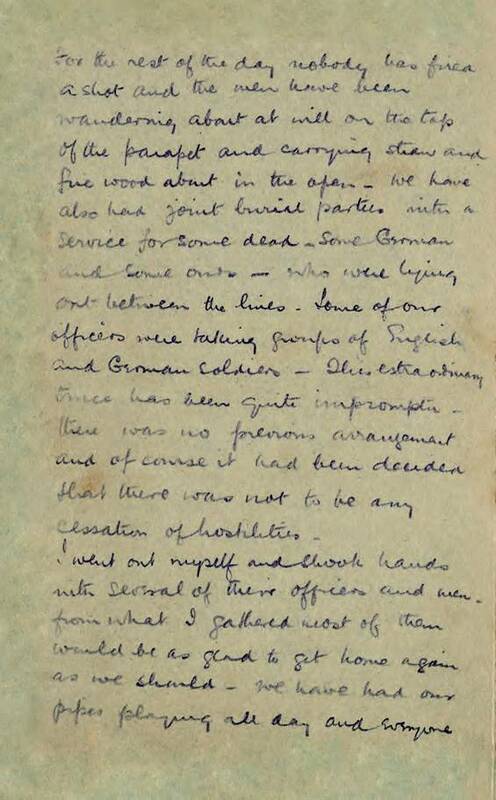 On Christmas morning, the officers return to No Man’s Land and coordinate the burial of the dead. After the bodies are interred and a service is read over the graves, fraternization resumes with a hastily arranged football match and card playing, and there is even a juggler entertaining the troops. The next morning Horstmayer, the German officer, walks over to the French line. British and German soldiers met in No Man’s Land, gossiped, exchanged cigarettes. In some places they played football. They met again the next day. Then, after strong rebuke from headquarters, ring gradually started again. No one was punished for participation, and very few of those who took part allowed the event to alter their view of the war. The truce did include shared drinks and spontaneous games of football, but it also featured solemn burial parties and moments of treachery. Furthermore, the manner in which the details of the truce were accepted by the British public demonstrates that the home front was ignorant neither of the conditions on the Western Front nor the attitudes of the soldiers who served there. Consequently, the holiday armistice, in itself a fascinating and complex episode, also serves as a means of achieving further insight into the experiences and attitudes of soldiers on the Western Front, the views of the British public toward the war, and the way the discourse of the war has evolved over the past century. As a result, the 1914 Christmas truce, an event that at first glance appears to confirm the popular interpretation of the First World War, can be used to challenge that view and contribute to a more complete understanding of both the conflict and the development of the war’s orthodox narrative. Spent a very quiet Xmas day. Troops fraternized with enemy on 6th Div. front and held a concert and football match. Pork for dinner. While all these accounts provide details that could be found in certain of the 1914 holiday truces, they tend to treat the armistices as more consistent and homogenized than they actually were. 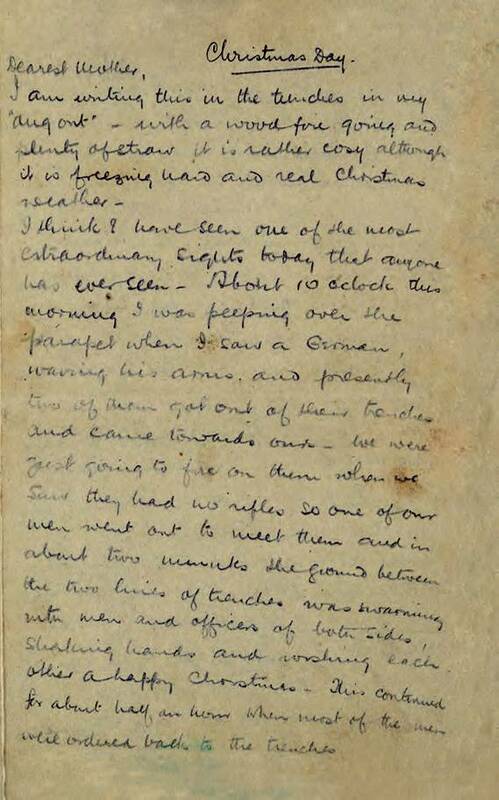 The Christmas truce was certainly a moment of “peaceable behavior,” as Gilbert notes, but participation was motivated more by the holiday season than by a desire to lay down arms. Certainly the cease-fire was inspired partly by the idea that the enemies opposite were men like themselves, but few soldiers participating in the truce would have believed that, by ghting a war that they perceived as necessary, they were not behaving decently the remainder of the time they spent in the trenches. The football match that De Groot claimed was inspired by the atmosphere of the truce did occur, but it was the exception rather the rule. Terri Blom Crocker: "The Christmas Truce. Myth, Memory, and the First World War", University Press of Kentucky: Lexington, 2015. 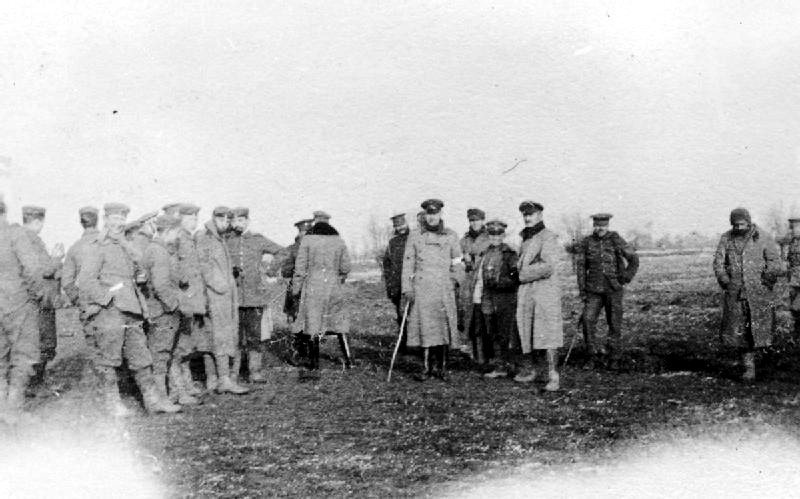 In a letter published in the Times, the German lieutenant Niemann explained that in his sector at Frelinghien-Houplines a football match had been played which had run out 3:2 for the Germans - a symbol of Christmas peace which contributed to the formation of legends. However, the truth content can no longer be verified today. What is certain, however, is that there was an unorganised kick between the opponents, but that it was not played on a goal, let alone with a referee. So it seems that these matches did in fact occur, well, some of them, but were much more often only proposed or reported as rumours, most accounts attesting the matches as occurring in "that other unit". It is therefore not quite right to assume that within the hour peace broke out along the lines and almost a league being devised ad hoc to 'shoot it out on that kind of field'. Kicking around and playing did occur; a real match is attested for very few times and quite unlikely for most, later reports. An organised match in our current sense of the word and how some have been reported: remains uncertain. There are no British descriptions of this game but Private Collier of the Argylls recalled ‘some of the men in the Platoon on our left had made a “ball” from paper, rags and string and went their “dinger” for about twenty minutes, until the ball fell to pieces and that was that’. The two stories of the 133/Saxons’s officers, Klemm and Niemann, are essentially similar to Niemann’s post-war history of the battalion reporting soldiers of both sides chasing hares amongst the cabbages and then playing football. (Niemann, Das 9. Königlich Sächsische Infanterie–Regiment Nr.133; the official war diary of the 133 is missing from the Sächsisches Staatsarchiv in Dresden.) None of the British officers of the 2/Argylls mention playing football, but all agree that an ‘international’ match was discussed. With 1,000s of young men standing around in No Man’s Land on Christmas Day unable to really converse with each other once impromptu sign languages were exhausted and trinkets exchanged, somebody would have kicked something, and somebody would have kicked it back. Then, perhaps somebody would have hurried to inflate a ball received for Christmas or carried in their packs. 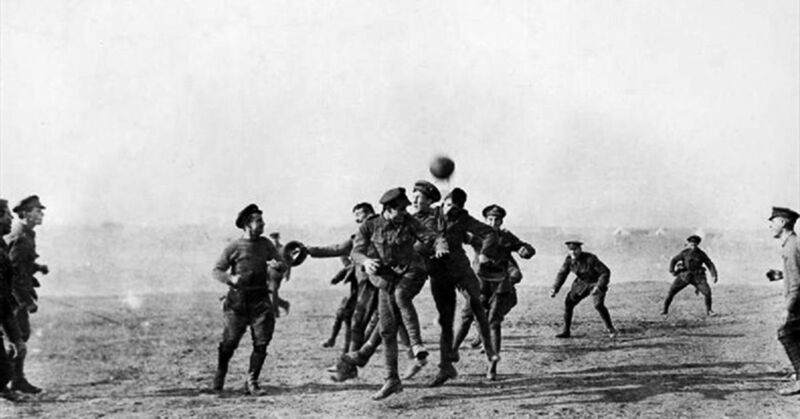 It is certain that soldiers did not play a football match in No Man’s Land with stretchers for goalposts and the padre declaring Captain Blackadder offside, but with so many young men milling around, kickabout games of football with tin cans, paper wrapped with string, straw-stuffed balaclavas or perhaps with a real ball inevitably occurred, the players cheered on by their brother soldiers. However, many, including historians, know that if any football was played, it would have been in the form of improvised kickabouts and many websites, including some pages of Football Remembers, do mention football games (plural) away from their headlines. One German author, not a historian but quite thorough has sifted through quite a lot of letters and other documents relating to that fact. In Michael Jürgs: "Der kleine Frieden im Großen Krieg: Westfront 1914: Als Deutsche, Franzosen und Briten gemeinsam Weihnachten feierten", Bertelsmann: Gütersloh, 2009, he lists numerous of these occasions. One thing even this author – so eager to display the humaneness in war – soundly rejects in his conclusions is that these "matches" even produced reliable results in the form of "Argylls 2: Saxons 3", relegating this level of detail into the realm of legend. The spontaneous truces around Christmas are certainly not a myth. The football playing occurring around these are probably not a myth. The amount of playing that took place in every instance, the area of distribution along the front, or the amount of playing that took place overall, is very probably grossly inflated and very heavily distorted in the popular imagination and remembrance. This one is much too nice to not wanting to believe the most inflated account to be true. Folk songs and anecdotal evidence - not good enough to prove anything, but they have the ring of truth. When researching the Christmas Truce for the 100th anniversary, I ran across a scholarly article (sorry, don't have the reference) that claimed soccer games (not matches) and other friendly exchanges didn't occur just at Christmas, but continued well into the spring. At that time the two sides were in a stalemate, wars of old generally didn't progress much during the winter months, and there wasn't much for the soldiers to do but hang around the trenches. The games and friendly exchanges were born of boredom as much as anything else. Further, the upper ranks on each side were appalled by the friendly behavior of the solders and had pressure from the top brass to stop such activities. Thus you will be hard pressed to find much in the way of official acknowledgement from either side. Kinda reminds me of our family story that our name was changed as great grandpa came through Ellis Island. The official line from the Ellis Island Museum is that despite tens of thousands of anecdotal stories, there is no documented evidence that names were changed at Ellis Island. Well, duh! John McCutcheon wrote a famous (and fantastic) folk song about the Christmas truces called "Christmas in the Trenches." The song includes a reference to the impromptu soccer games. As a result, McCutcheon has become something of a magnet for anecdotal Christmas truce stories from very old WWI vets, none of whom are alive any longer. A fan took McCutcheon for a surprise visit with Frank Buckles, the oldest and last surviving WWI soldier in the USA. McCutcheon describes what Buckles thought of the veracity of his song in a YouTube video. Back up to 3:32 in the video if you want to hear the entire Buckles saga, or start at the beginning to hear how the surprise visit was arranged. This is also one of the best live videos of the song IMO. McCutcheon tells the story of four German WWI vets who came to hear his concert every night while he was on a European tour because everyone else discounted their stories of the Christmas truce as simply the fanciful ramblings of old men. Anecdotal though they may be, they are good stories and a good song. What could be better at this time of year? Not the answer you're looking for? Browse other questions tagged world-war-one united-kingdom imperial-germany game christmas or ask your own question. How historically accurate is Age of Empires III? How were the British and French armies invited into Belgium in 1914?